Saturday 9/22/18 – THE DAY BEFORE: I woke up at 4AM for 75 minutes of yoga followed by a 6AM social run at Lifetime. Then I proceeded to drive down to AC for the mandatory athlete check-in, bike check-in and pre-race meeting. I ran into many familiar faces from Tri-856, T3 and the Williamstown Badgers but had limited time for chatting, having to return home by1:30 for parent-duty, laundry, etc. On this particular afternoon I chose to have nothing but fun with my two boys since I knew I wouldn’t see them until the evening after IMAC. I took them swimming for most of the afternoon and out for dinner and frozen yogurt. I finally put them to bed around 9:30 PM after we watched CARS 3 for the 50th time (give or take). By then I was pretty worn out but still had to prep my race bag for the day ahead. As always, I packed my bag with a check-list in hand so not to forget any essential items such as my helmet or goggles. Prepping for race day is a pretty quick task, especially when it comes to nutrition because I’m a true minimalist in that department. I rely on one essential Supplement, XRCEL, for all of my endurance events. I finished packing for IMAC by tossing 6 bottles of Peach-Tea XRCEL in the front pocket of my back pack. Then I proceeded to set my alarm clock for 2:45 AM and hit the hay. Sunday 9/23/18 – RACE DAY: I hit snooze too many times and didn’t crawl out of bed until 3:30. At that point, I knew I’d have to take an alternate route to the race parking lot (they close the exits in AC at 4AM) and probably only have about 45 minutes to set up in transition. Good thing my bags were packed and sitting by the front door. I hit the bathroom, threw on my favorite tri-kit and trucker hat, grabbed my bag (and a banana) and headed out the door. After a 55 minute drive into AC, I found myself sitting in standstill traffic waiting in line to park my car at around 5:15AM. Note to self – arrive early next time! It was 5:45 by the time I parked and I was still about a1/2 mile away from transition. I grabbed my bag and bike pump and bolted towards transition only hoping I’d have enough time to hit the port-o-pot before the start! SETTING THE STAGE: I’ve done enough triathlons at this point in my life so setting up transition is pretty easy. I place everything in line for easy access. This day was a bit different because the forecast was calling for rain to be heavy at some points, so I strategically placed my sneakers in a plastic bag with the hope that they’d stay dry and easy to slip on after the bike portion. I placed 2 XRCELS in my bento box and three on the ground next to my cycling shoes. One of these three would go in the pocket of my tri-kit before hopping on my bike. I grabbed the 6th and final bottle of XRCEL and headed towards the swim start. I am proud to say it took me less than 15 minutes to set up my gear – leaving enough time for a bio-break before the race! THE SWIM: What I love most about this race and most IM events is that you can self-seed according to your ability. As a faster swimmer, it drives me insane when I’m placed in the last corral simply because I’m a middle-aged woman. I truly believe that self-seeding, if done right, is beneficial to all athletes. I took my place in the 2nd coral (27-35 min) and waited for the start. At 6:40 AM I threw back my first bottle of XRCEL knowing it would kick-in within minutes of my swim. It hits the bloodstream fast. On occasion, I jokingly call it “liquid crack” because it gives me an instant jolt of energy that makes me want to go-go-go! The best part is that is lasts for 45 minutes (longer for me) before you need another bottle. I started the swim and quickly realized that I chose the wrong goggles. They were tinted and it was still dark and cloudy out so it was really difficult to see. Additionally, the water was a bit choppy so the swim wasn’t as calm as I’d envisioned. I swam off-course more than a few times which is apparent in my time (36 min. ), but I still felt great! Contrary to most, swimming is my absolute favorite part of triathlon. What better way to stretch out and loosen up your legs for what’s to come? I exited the water, pulled off my cap/goggles and began sprinting to T1, feeling invigorate by the spectators cheering as I ran. I felt so energized that I completely forgot to grab my XRCEL for the bike. Thankfully I had 2 bottles stowed in my bento box for later! THE BIKE: This is the portion of triathlon where I struggle. I’m an average cyclist at best and I’ve become accustomed to getting passed, a lot. I don’t let this bother me because I know I can pull through and make up time on the run. When I’m on the bike I compete against myself and push myself to the cusp of Zone 4. I work hard, but not so much that I’m breathless. On this particular day, I was flying through the course. It was as if the race director said, flat and fast. I found that I was maintaining 20+ mph with ease and it wasn’t until mile 10, at the first aid station that I remembered I hadn’t taken in any nutrition yet. Even though I didn’t feel tired or hungry, I drank one bottle of XRCEL. I knew I would need it soon enough. I may not have needed it to go on but it sure gave me the energy and motivation to keep up my pace. It wasn’t until mile 45 that I started to slow down and that was mainly because of the rain, which was coming down pretty heavily. My pace slowed considerably given my overly cautious nature. To me – safety comes first. I’d already seen multiple flat tires and accidents on the course and I didn’t want to become a victim to this race. I focused hard on moving forward at the fastest speed while maintaining a safe distance from my fellow athletes – about 16 mph at that point. It had been close to 2 hours since my last XRCEL and I wanted to drink another but my hands were frozen and numb from the rain and I didn’t want to risk stability on my bike. I finished the bike in 3:01 having consumed 1 banana and 2 bottles of XRCEL. How was I still going? THE RUN: I’m always excited for the run and it was no different at IMAC. In the pouring rain with frozen hands I had the biggest smile plastered across my face as I hopped off my bike. It was finally my time to shine and FINISH STRONG. Slight issue in T2 though. As I hunched over to tie my sneakers my hands weren’t working. They were numb from the cold rain and I just couldn’t seem to get them to move. Never before had I experienced anything so absurd! After 5 unsuccessful minutes I decided to find help. I took a deep breath, drank my 3rd bottle XRCEL and jogged towards the “RUN OUT” sign with untied laces. It was there that I spotted what looked to be a volunteer and I kindly and somewhat embarrassed asked her if she wouldn’t mind tying shoes. She didn’t even think about it and quickly completed the task at hand and sent me off with a loud cheer “go get it!” Did I mention how awesome the volunteers were. Phenomenal – all of the them! So I’m running with heavy legs for the first ½ mile or so when the XRCEL surge hits me. All of a sudden I’m running comfortably at a 7:15 pace while high-fiving spectators on the sidelines. Probably a mix of XRCEL, adrenaline, positive vibes and my sheer love of running. I felt so alive and motivated to get it done. The course was amazing with spectators the entire way. I think the course ran through most of the AC boardwalk so it’s impossible to be bored with everything going on around you. It’s pretty amusing and I enjoyed every minute. The best part was seeing so many friends on course. I did a lot of high-5ing! Before I knew it I had a mile to go and hadn’t thought to drink the XRCEL in my back pocket! Didn’t need it. I sprinted that last mile like my life depended on it and crossed the finish-line with a 32 minute PR! Official Time: 5:36:15. What a RUSH!!! 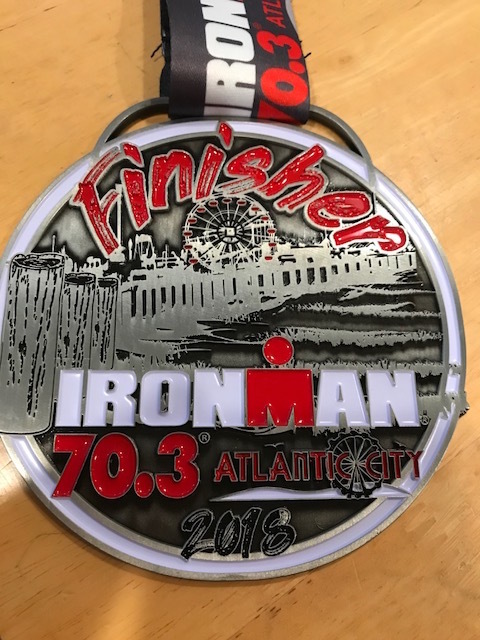 FINAL THOUGHTS: It was an amazing race for me on so many levels! Yes, there were challenges – the weather was no joke and the whole shoe tying situation just seems comical to me at this point. I spent nearly 10 minutes in T2 due to numb hands. Lesson learned – I’ll be purchasing bungee laces before my next race. All in all – IMAC is a wonderful event with awesome volunteers and an amazing race director/event staff. Kudos the Delmo Sports. They never disappoint! Final shout out to TEAM XRCEL. I should have consumed more during IMAC if I’d stuck to my plan of 6 bottles (vs 3). I only wonder how much time I couldn’t shaved off if I’d drank more. This stuff really is magic – better than any supplement I’ve tried (and that’s saying a lot). I may have to give IMAC another go in 2019!